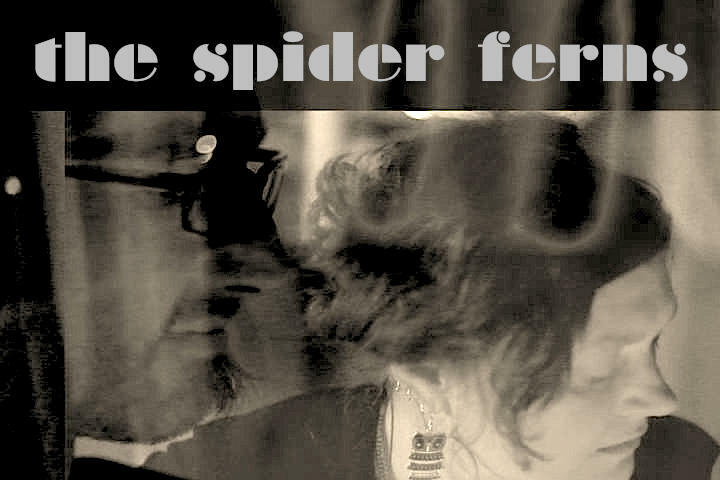 The Spider Ferns are Kelly and Alton Fleek, a wife-husband pair who create neo-psych chill-tronic melodies. They have dropped some lovely new tunes, and will showcase their debut album, Soon Enough next Thursday, 1/29/15 at Barboza. All tracks are written, produced and recorded independently. I was excited to get a chance to discover how these lovebirds conceptualize their musical and artistic endeavors into their passionate reality. Spider Ferns: We both grew up in the Seattle music scene of the ’80s & early ’90s. 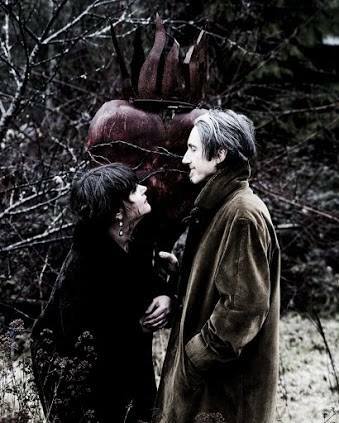 We were both musicians & had various music projects, but had never had a serious project together. About six years ago, we were up in the middle of the night, discussing our mutual desire to create together. . . we were forever shelving this idea for other pursuits. I think we were a bit nervous about moving forward because we loathe conflict between us & we knew how emotional it can be to create as a couple. Oddly enough, we bickered for an hour about how we should proceed. It got quite heated; then Alton grabbed an acoustic guitar and we wrote a song right then and there. . . a lofi track called “We Resolve.” We recorded it in our friend’s kitchen on GarageBand, but have never released it. We ‘resolved’ that very night, that music was of paramount importance to us as a couple, and that all of our electronic music would forever be grounded in lofi roots so we could strip down & play anywhere. Also, so our music would maintain an organic feel. How would you describe your sound? What do you and your partner like to surround yourselves with to inspire you when making music? SP: We call our music ‘Electronic Trip-Rock’. We have elements of Trip-Hop in our work and our beats are all individually crafted. Our beats combine loops, samples, keyboards, synths, and organic instruments in their creation. We don’t use standard drum machine presets, preferring to create something that has a more unique and organic vibe. We combine these beats with our live instrumentation, which gives our work a presence, and crosses it over into other genres with elements of jazz, rock, european classical & trip-hop. We are what we call ‘Pan Dimensional’ in our living situation. Twelve years ago, we made the decision to purchase a barn on six acres, an hour north of Seattle in Skagit County. We live most of the week here and have a second place in Seattle for 2-3 days a week. We just couldn’t give up our city entirely. We prefer to surround ourselves with quiet to create. We are both working artists & musicians. . . our place is basically a home studio, filled with art & musical equipment. We look out at a horse pasture, a large expanse of forest. We are nestled at the base of the Cascade Foothills. Our music is infused with discussions of the weather. We live at 500 ft of elevation. There is nothing more magical than a roaring wood stove and an eagle sitting in our tree to get us inspired. That, and we simply enjoy solitude. It’s a perfect balance for us. What can show-goers look forward to at the 1/29/15 show at Barboza? SP: We’ve expanded our visual show for the event and we have two fabulous local bands (Modern Ruins & Screens) that will be supporting us for our CD release. We’re going to be playing our live show to fully remastered beats for the album release. . . something we’ve wanted to do all of last year and is finally come to fruition. It’s going to be an absolutely gorgeous night of sound and one hell of a celebration. Does visual art come into play with the live component of the band? SP: Absolutely. Kelly is a textile artist and loves to create interactive installations. We have small festivals at our northern dwelling and we create unique installations for each event. Light installations follow us for nearly every event. . . we love integrating mobile works into our shows. They create a dreamlike vibe that compliments our music wonderfully. What else do you have planned this year with visual art and music? SP: Kelly will continue to show her visual art. She creates handknit, wearable sculptures, paintings & installations. Together, we have decided to begin casting silver art jewelry. . . it was time to do something new. We love creating together on many levels. Jewelry has been something we’ve long hoped to do. It’s great to make time this year for it to happen. The Spider Ferns will be touring the U.S. and we will take a trip across the pond finally. We are currently booking a European tour. Our plan is to tour for at least a month there. We collaborate with several folks in NYC, Philadelphia, London & Italy. We also have friends in Belgium & France we’d love to see. The plan is to tour the U.S. with an extended stay in NYC to hang out & make music with Audiosapian & our Philly collaborator, Tethys. Then, we’ll hit Europe. We’ve also begun work on our next album. We’ll be releasing an album of collaborations and remixes in the spring titled Lo Flux Radio, a title we have decided to give Spider Ferns remix albums. We will also have limited addition vinyl in the spring, when we release our album of remixes. Kelly Fleek: Also, I am currently in a group show at the WA State Convention Center. I have two sculptures in a traveling exhibition, “The Meaning of Wood”, about the fate of our forests. Written by: Marz on 01/23/2015. Last revised by: BBS, our reviewer, on 01/24/2015. This entry was tagged Alton Fleek, Audiosapian, kelly fleek, marz time, Soon Enough, Tethys, The Spider Ferns. Bookmark the permalink.